As well as an excellent range of 1/72 historical figures, Caesar make a range of fantasy figures with the same claimed scale of 1/72. While we do not generally cover fantasy we created this article with images of these figures as they may be of some value for converting or similar historical uses. All the figures are shown with a scale which is in millimetres, and as can be seen from the pictures all are superbly sculpted. The figures below each figure show the number in each box, although we understand this can vary, as indeed can the precise figures included, so this is only a guide. All the figures are in plastic but some have been done in a silver colour to blend well with metals. Gimli and company don't seem to be big on shaving, or indeed big at all. The fourth figure in this row has a ring hand for the axe. I didn't know Catwoman was an elf! Legolas and friends never looked so good. Some days lunch just can't come soon enough. This looks like a job for Sinbad. I had an adventure recently. I visited a new branch of Tescos. Yes actually, that does count! The comment about 'contents will vary' applies double here - the box says you get 15 figures plus 4 random ones which may or may not be those we got! 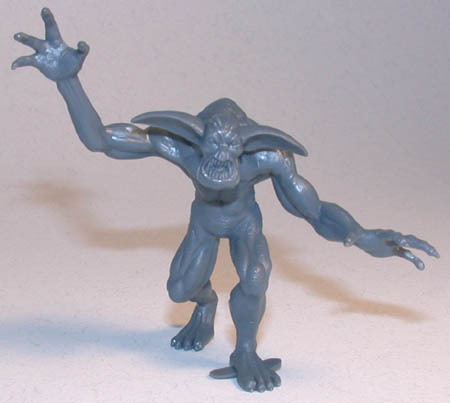 Our friend here stands 55mm tall. I wonder what kind of adventures he has? 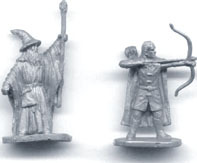 These are the remaining possible figures in this set. Doubtless any resemblance to Ian McKellen and Orlando Bloom is purely coincidental. Ah, aren't they cute? Didn't Harry Potter have some trouble with a goblin of fire? Hey no fair. Those guys have hand grenades! Why are orcs always portrayed as the bad guys? Aren't they just another misunderstood minority that need a hug?